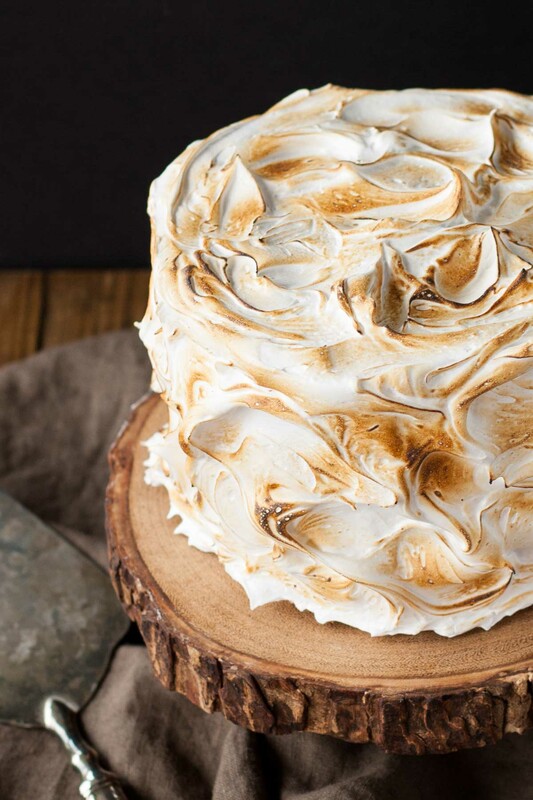 This S’mores Cake is better than the real thing! 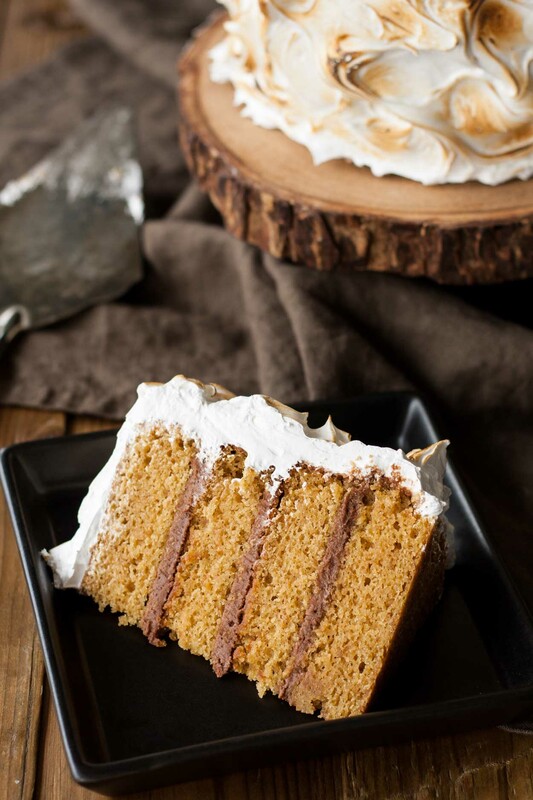 A graham cracker cake filled with a whipped milk chocolate ganache and topped with toasted marshmallow fluff. This is not what this cake was supposed to look like. Ryan requested another S’mores Cake because he loved my S’mores Bundt Cake so much and I was happy to make it again, but I wanted to try something different. My plan was to make a naked cake with milk chocolate ganache and marshmallow fluff between each layer. Except my store-bought marshmallow fluff was an epic fail. I had a little homemade marshmallow fluff left over in the freezer from the S’mores Bundt Cake, but was too lazy to make more, so I decided to top it up with some store-bought stuff. I’m not exactly sure what happened. I mixed the two together, and maybe I beat too much air out of it, or maybe the stuff I had in the freezer was too thin. No idea, but it was basically marshmallow soup. In hindsight, I don’t know why I decided to go ahead with it anyhow. Plenty of cursing, as usual — par for the course with my baking. It’s rare that something works out on the first go. It’s a wonder I keep doing it! I actually took pics of my fails this time, which I almost never do because I’m too pissed off at the time. The pics are crappy and unedited, but I thought you’d appreciate them. Here’s the lovely first layer that actually got entirely scrapped. It was still eaten, of course, but did not make it into the final cake. Like, what is even going ON there? Marshmallow. Soup. It’s comical really, in hindsight. I could NOT take pics of this cake….it was destined to end up on Cake Wrecks. So I scraped the whole mess off, MADE new marshmallow fluff from scratch, and covered the entire thing. It’s not the look I was going for, but I think it’s stunning anyhow. And, of course, the best part is that it tastes amazing! The graham cracker cake has a unique and delicious texture. 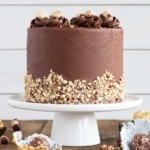 The cake itself isn’t too sweet and the marshmallow is light, but if you’d like to tone it down, you could always swap the milk chocolate for dark chocolate. 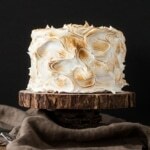 Either way, this S’mores Cake is delicious!! You could use dark chocolate ganache if you prefer, or a chocolate buttercream. If there are still some chunks of unmelted chocolate, microwave in 10 second bursts until all chocolate has melted. You can make the ganache a day ahead and refrigerate it overnight, then take it out and allow it to come to room temperature before whipping. Do NOT use store-bought marshmallow fluff. It’s too thin/runny. 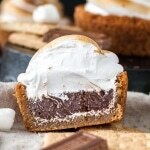 This S'mores Cake is better than the real thing! 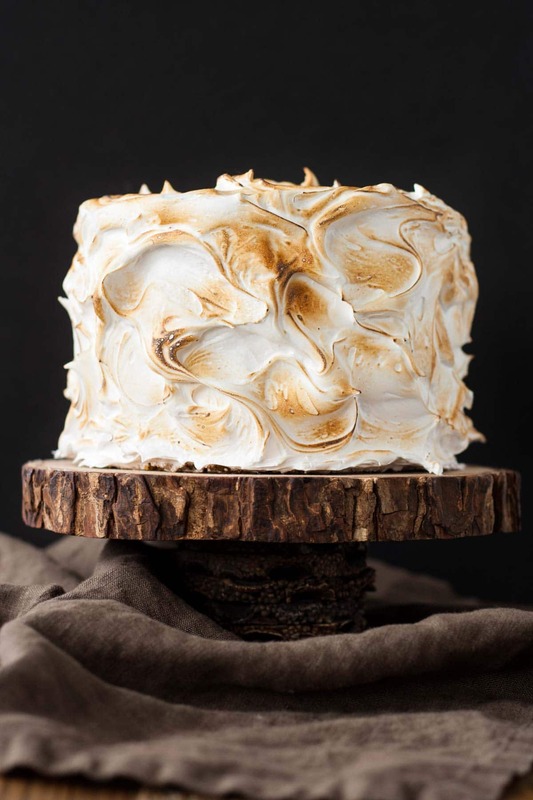 A graham cracker cake filled with a whipped milk chocolate ganache and topped with toasted marshmallow fluff. Transfer to bowl of stand mixer and whip using the whisk attachment until the ganache is fluffy and has lightened in color (approx. 1 or 2 minutes). Once the cakes have cooled completely, frost the layers with the whipped ganache. Place in fridge to set. Spread marshmallow fluff roughly all over cake and torch to toast. *You can use a milk chocolate buttercream if you prefer. **If there are still some chunks of unmelted chocolate, microwave in 10 second bursts until all chocolate has melted. ***You can make the ganache a day ahead and refrigerate it overnight, then take it out and allow it to come to room temperature before whipping. Amazing. I make a lot of cakes and I don’t know if I’ve ever left comments on a recipe, but this is perhaps the best cake I’ve ever made. Followed your recipe for the cake and the fluff. 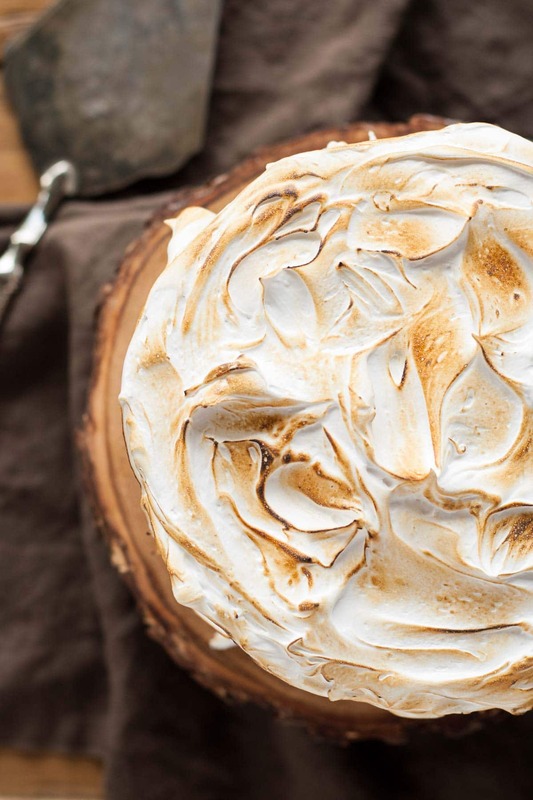 That Italian style meringue will be my go-to recipe forever. It’s perfect. Hi Lee! I’m so happy to hear that you loved this one so much to leave a comment! You totally made my day. Can this be stored in the fridge and then brought up to room temp before serving? If so, for how long can it be stored without altering marshmallow texture? Hi Taylor! I refrigerated mine (with the fluff already toasted). The fluff under the toasted stuff will start to soften fairly quickly and eventually turn a bit soft, though I’m not sure that has anything to do with refrigeration rather than just contact with the cake/ganache. It won’t impact the flavour though. I wouldn’t store it for longer than a couple days because the fridge tends to dry cakes out! I am a complete novice when it comes to baking, I don’t follow directions very well. I was still able to make this for my wife for her birthday since smores are her favorite. I ended up making it rectangular and it turned out just fine. Only issue with the directions was it calls for 3 pans but you show 4 layers of cake and that confused me. But I didn’t have any cake rounds so it didn’t much matter in the end. Thank you so much. Hi Dave! I’m so glad you were able to make this for your wife, I am sure she loved that you did that for her :). I did bake up 3 layers, but had a mishap with one of them (details in the blog post), so ended up just using the other two and cutting them in half to make four. For those who want to make a bigger cake, I made 1 and half the cake and put it in 9 inch pan at 375 for 20 minutes. Turn out perfect. Depending of the oven of course. Hi Julie! Thanks so much for your tips! Can you replace the frosting replace with a more simple italian swiss meringue? Hi Lexy! This is very similar to an Italian meringue, so it would work. A Swiss meringue might not be firm enough. The marshmallow fluff was way too runny and it was your recipe too. I followed every single step as directed. It looked good until I put it on the cake. Hi Carolyn! Sorry to hear you had trouble with this. The marshmallow fluff should be ver stiff. If it was runny that means there was likely some grease or egg yolk that got in contact with your egg whites. Hi Olivia! I’m planning to make this gorgeous cake for my bday in a couple of weeks. 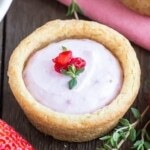 My mom is gluten-free, would this recipe work with GF AP flour? Would your other graham cracker cake recipe as well? Thanks so much! Your pics are amazing! Hi Mandi! Any cake recipe should work with a GF flour as long as it is a proper AP flour blend! Awesome! Thanks so much! I’m planning a trial run this weekend, fingers crossed! Hi! I’m hoping to make this cake this week! 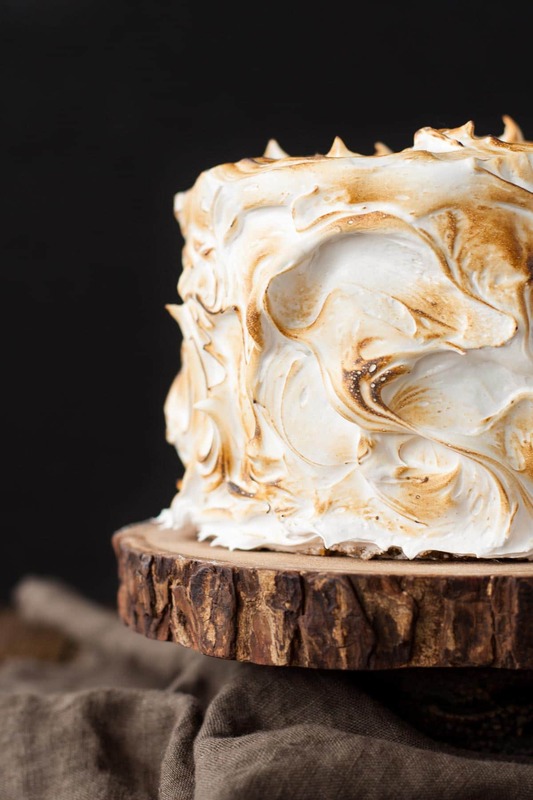 Question – can I put the cake in the fridge overnight after roasting the marshmallow fluff? Thank you so much! Hi Jess! Yes, but I would torch the fluff first as it tends to dry out. Hi, I am excited to make this cake!! I have couple of questions though. I need it to be a 14 inch cake. Would you double the recipe? Also once I torch the marshmallow fluff can the cake be stored in the fridge until the next day or should I wait to torch it until right before serving? Hi Peg! Converting pan sizes is always tricky. 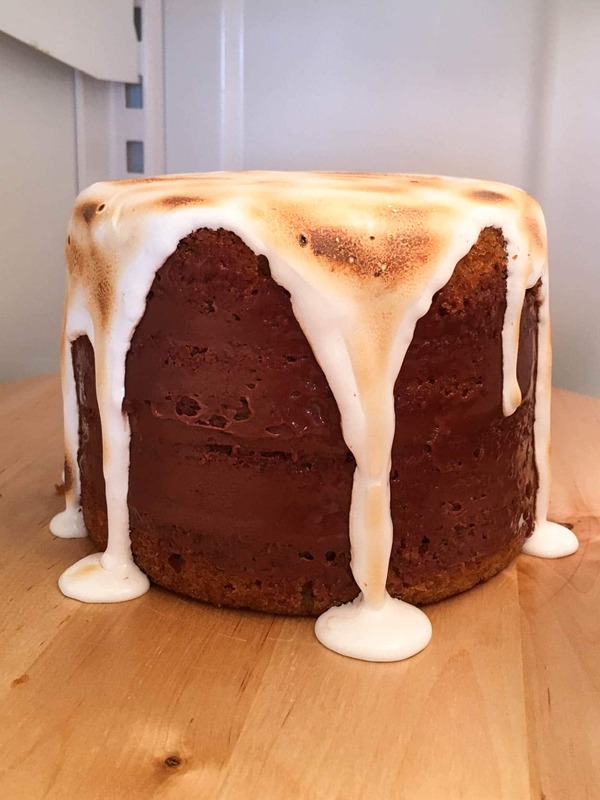 Here’s a site I use as a guideline: http://www.joyofbaking.com/PanSizes.html I would torch the marshmallow fluff before storing as it will dry out and might not look as pretty if you torched it after. I made this cake for my sons birthday and it was a HIT! Unfortunately I didn’t like the taste of the cake though. It was not very sweet (I may have overcooked it?) and it definitely did not taste like graham crackers. I am wondering if its because I used a vanilla that I got from my in-laws recent trip to the Dominican Republic? It just plain had a funny flavor. Anyway, the fluff and ganache were amazing. I just can’t figure out what the cake was supposed to taste like. Your directions were very clear and easy to use for a beginner like me! Hi Amy! So glad you found the recipe easy to follow. The cake has a decent amount of graham cracker crumbs so you should be able to taste it. I don’t think the vanilla would affect it, but possibly? It is more of a dense cake though, more of a pound cake almost, so maybe that’s what was throwing it off? I would like to share that I made this cake and it turned out beautifully! I did have trouble with my first batch of fluff–it deflated and never got fluffy again. I figured out why! I live at high altitude (7.000ft.) and I hadn’t calibrated my candy thermometer before preparing the marshmallow fluff. Before trying a second batch, I calibrated the thermometer and found it was 7 degree F off, which means the difference between hard ball and soft ball stage. I made the adjustment and the second batch was perfect! I also made a couple of altitude adjustments for the cake and it came out great! This cake is beautiful and I can’t wait to try it! I am wondering what kind of kitchen torch you use. There are so many kinds out there. Thank you! I made the cake and love it! but i did get comments it was a bit too sweet, I was thinking the dark chcocolate ganache may help that instead of the milk chocolate. I am wondering will the ratio be different of dark chocolate and cream? Hi Domenic! Dark chocolate would definitely tone down the sweetness. You would have to change the ratio, I would recommend using a 1:1 ratio of dark chocolate to cream (by weight) vs a 2:1 as it currently is for the milk chocolate. I made your cake yesterday, for my mom’s birthday. I prepared the cake, ganache and marshmallow fluff the day before and assemble the cake a few hours before dinner. I was so scared of making the marshmallow fluff but it turns out amazing. The cake was delicious and so pretty. My mom, who doesn’t lile a lot cakes, loves it, especially the marshmallow fluff. 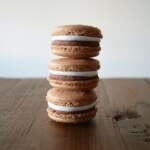 I’m planning on freazing the extra fluff to make, after the holidays, your s’mores cookies. Hi Syrine! So happy to hear that you and your mom loved this one 🙂 Making the marshmallow fluff is stressful for me too due to the boiling sugar — glad it worked out!! Hi! This is beautiful and rustic! How long can this keep for and in or out of the fridge? Gosh I hope to make it soon! Hi Loganne! Thank you! I usually refrigerate my cakes, but it would be fine out for a couple days too. Can you confirm that this recipe should fill 3 6″ pans? I count 4 layers in your cake pictures. Thanks! Hi Alex! Yes, the recipe makes three 6″ rounds that are a full 2″ tall. I had to scrap one of my layers (details in the post), so cut the remaining two in half horizontally. If you want the cake to look just like mine, use 2/3rds of the recipe and bake in two 6″ pans. I hope that makes sense. Let me know how you like it! I’m planning on making this for baby’s 1st birthday. Is the marshmallow frosting going to be a nightmare with a 1 year old? Like, worse than regular frosting? Hi Amanda! A nightmare in what way? It IS very sticky, especially when first put on the cake, but softens over time. In general though, probably a bit more messy than a regular buttercream. Hi Amanda! Honestly I think that will be really tough with the marshmallow because it’s so sticky. I don’t think you’ll be able to get it perfectly smooth, but you can try? Thanks.. I might just stick to doing the marshmallow as a topping. And for the cake is it softened butter? 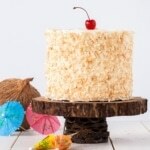 Your cake is gorgeous and has me drooling every time that I see the picture! I had to make an attempt this past weekend and while mine definitely did not turn out as beautiful, I was still happy with the result and it tasted amazing –that marshmallow fluff! I also added a layer of chocolate cake in between, so yummy! Thanks so much Ashley! So glad you liked it and omg I LOVE the addition of a chocolate cake layer!! Hi! Trying this out right now. My cakes are in the oven, they’ve been in there for about 20 minutes. The sides look like they’re rising, but not the middles. The batter was a little bit chunky because of the graham cracker. Any reason they might not be baking right? Hi Annalee! Sounds like they just needed a bit more time in the oven. How did they turn out? They turned out okay! A little over-cooked, however. I must’ve done something wrong! I am so glad I found your site! I didn’t have all the tools or even the correct size pans, but I made this for Christmas and it was a big hit! So delicious!! Thanks for sharing! Hi Sara! That is awesome, I’m so happy you liked this recipe! I made this cake last year for my birthday in December and I fell in love with it. The marshmallow fluff was a hit with the others and I loved it overall. My bday is coming up again and I’m researching what bday cake to make myself and I 98% sure I’m going to go with this one again. Loved the recipe! I did make a slight change though, I made the graham cracker cake AND devil’s food cake and alternated those layers. Thank you for the great recipe! I made this today for my son’s birthday and it was big hit! I was a little intimidated by the homemade marshmallow fluff but I followed your instructions exactly and it turned out fabulous! Yay! The MMF is intimidating for sure, I totally get it, but I’m so glad you tried it and that it worked out! Hey Olivia! I made your cake yesterday for my family engagement party (I am the cook of the family so of course I am stuck making my own engagement party cake, lol) and it was a HIT! While the third layer was baking in the oven, as I only had two pans, I had to run to the store to get a candy thermometer because my parents didn’t have one. Turns out they accidentally undercooked it and it ended up being unusable. STILL, the other two layers turned out great actually huge, so it worked out. The whole family was oohing and aahing over it. Definitely a keeper!! 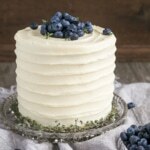 Can I make cake a day ahead and refrigerate? Hi Alexa! Yes, that should work fine. I refrigerated mine afterwards. Hi there. We are getting married in August backyard wedding. I want to make this Smores cake as it’s very suiting. How long do you think I could refrigerate this cake for? Hi Angele! The frosting will not hold up very long. It will get softer the longer it sits in the cake and become very gooey. This isn’t a bad thing, but could make for messier cutting/serving. Ideally serve same day, but will be ok overnight but the marshmallow will get soft. Thanks so much for your tips Angele! Can I tell you how much I appreciate the pictures of your “fails!” My first attempt of your cookie dough cake was a total #pinterestfail. It was really comical – thankfully it still tasted delicious! My second attempt turned out MUCH better and gave me the confidence to try the Pink Champagne Cake. Wrong sized pans, over-mixing (I suspect), and too much food coloring resulted in some really hideous, magenta, super-dense crepes. Haha! Tried it again and it went much better! Thanks for allowing us to see that even you have those mishaps too! Enjoying trying your cakes and learning lots of new tips, tricks, and techniques. I think the S’mores cake is next! I made this yesterday for my daughter’s 9th birthdsy. She asked for a Smores Cake completely out of the blue and thankfully I found your recipe the night before. I did 3 8-inch rounds and doubling the recipe was perfect! The batter is amazing, I was so worried that it would take longer, but an extra 15 minutes did it. I also doubled the fluff, and was incredibly surprised at how easy it was. I didn’t cover the whole cake, too fancy for a kids party, but I layered chocalate and fluff in between the layers. Stuck 4 wooden dowels in it so that it wouldn’t slide around and stuck it in the fridge til we were ready to leave. I was afraid the South Florida heat and driving to the party would melt it but it held up well! I got lots of thumbs up on the drive there as I held it on the passenger side the whole way. It was a show stopper! And it tasted delicious. Thank u for a grrrrreat recipe that was easy and no fail especially for putting it together last minute. Much appreciated! Hi Sandy! I’m so glad this cake was a hit. Good call on the dowels, especially with the marshmallow between the layers. Thanks for your sweet comment! Amazing cake! It’s perfect! So s’mores-y! I used 3 x 8″ rounds, and the bake time was only around 30 min. Thanks for the awesome recipe, sharing! Hello I found this recipe and am dying to try it. I want to double the recipe. Would doubling the recipe be good for 2-9 inch cakes or would it be too little? Hi Nazia! I think that would be too much actually. This recipe makes three 6″ or two 8″. I would try it as is in two 9″ with slightly thinner layers, or 1.5x the recipe. Let me know how it turns out! I’m planning to make this cake this weekend and I can’t wait! One question though, should the butter in the graham cracker cake be salted or unsalted? Hi Chelsea! It should be unsalted 🙂 Let me know how it turns out! My daughter has asked for this cake for her baby shower. I am VERY nervous about this. Lol. How far ahead could you make the entire cake with a complete setup? I’m afraid the marshmallow may react badly to being refrigerated until party time. Hi Tammie! 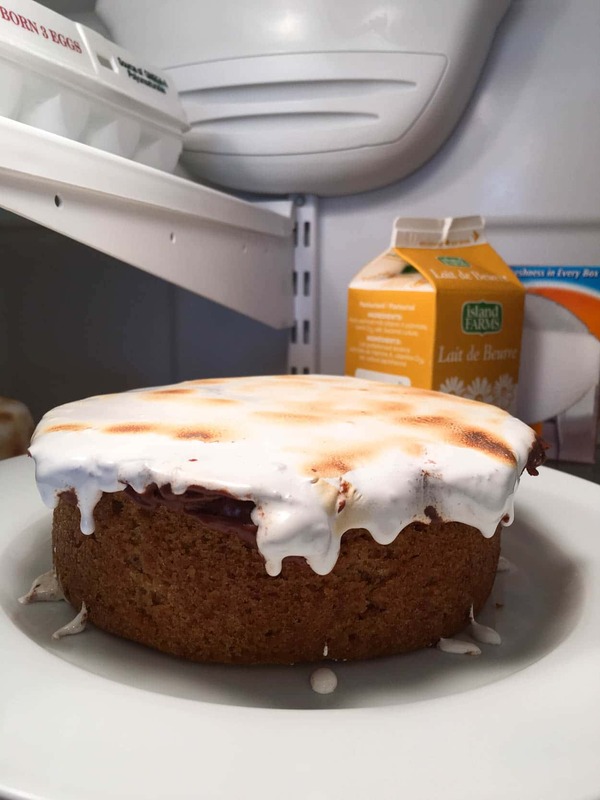 I had this cake in the fridge and the marshmallow held up just fine. It’s obviously better served same day, but I think it should be fine a day or two later :). Thank you so much. I’m so excited to see how this turns out! I absolutely love your candor. I laughed because I too sometimes do the try, try again method. Or better known as Plan A, B or C. I’m just too stubborn to give up cake decorating! I think the cake looks stunning. I will give it a try. Hi Janet! I’m glad I’m not alone, haha. I hope you like this cake!! Please let me know how it turns out :). I’ve read all the comments about doubling the cake recipe and the marshmallow fluff what about the ganache? Should that be doubled as well? I am planning to make 3 8 inch cakes. Hi Olivia! I’m going to try to make this cake the day before I want to serve it. Do you know if the marshmallow fluff will go flat once it’s already on the cake if it sits for a day? Also do you think it would be okay to sit out for a couple hours in a kitchen that’s about 80 degrees or should it stay in the fridge until I serve it? Thanks for your help! Hi Rem! If your marshmallow fluff turns out and is firm like it should be (not runny) then it will hold up! I would store the cake in the fridge overnight, then take it out a couple hours before you plan to serve it. Please let me know how it turns out! Hello! I am thinking of making this cake next week. I know I have to double the cake recipe since I am planning to use three 9″ cake pans. Do I need to make more fluff as well? Also, for your homemade marshmallow fluff recipe, how many cups will that yield? I can’t want to make this! so excited! Hi Leila! The recipe makes about 3-4 cups of fluff. I always have some left over, but can’t remember how much exactly. I would 1.5x the fluff recipe to be safe. Let me know how it turns out! I’m sorry if this question was already asked but, if I wanted to make this in 9 in pans, would I double the recipe? This looks FANTASTIC by the way! I just got a culinary torch and have been looking for something to use it on! Hi Jennifer! Yes, you would double it for three 9″ cake pans :). Please let me know how it turns out! Hi Melanie! I would try to smooth the marshmallow out as much as possible in that case. It’s not the easiest thing to work with since it’s very sticky, but I think the smoother look will be better with the drippy ganache like you said. I’m not sure that making it thinner would work as the marshmallow might not adhere to the cake as well and kind of ooze off like it did for me at first. Do you plan to toast it before adding the ganache? This is really one of the best cakes I’ve ever made! I followed all the directions exactly and it all turned out perfectly. I don’t have a torch, so I frosted the whole cake with the marshmallow and pressed graham cracker crumbs on the sides. Then I broiled it briefly to toast the top. It looked really pretty and tasted amazing. Thanks for the great recipe! Hi so I’m considering making this cake for a birthday party this coming week but I have one concern. Is it dry at all? I’m a little nervous since there isn’t any “frosting” on the cake. The meringue acts like a frosting as does the whipped ganache, so they compliment the cake well. Let me know how you like it! Hi Sam! I don’t see any issues using a marshmallow buttercream, it should stick to the cake/ganache just fine! I guess one more silly question too, do you put the ganache on the top layer of the cake? What I’m considering is doing the graham cracker cake, covering the layers with the ganache, and then frosting the cake with a mashmallow buttercream. Let me know what you think! Hi olivia! This looks divine! Can this cake be left at room temperature for about 8hrs? I live in Sydney and its winter season at the moment and was thinking of a cake idea to sell at the markets. Hi Nina! It *should* be ok at room temperature for that time. Which markets do you work at?? My sister lives in Sydney and frequents the markets often :). This looks so great! I have two questions for you. How did you torch the cake? Do you think it would work in the broiler (if you just did the top layer of a naked cake). In another comment you mentioned the key lime pie cake as a lighter option, but does that cake taste as graham cracker-like? Hi Kristine! I use a kitchen torch to torch the marshmallow fluff. You could totally do it in the broiler if it was just the top layer and no buttercream on there! The Key Lime Pie cake totally tastes like graham cracker too, it’s just a fluffier cake while this one is more dense :). Let me know if you end up trying it!! Hi, I would like to know if the cake is moist? Hi Prisca! The cake is moist, but dense, if you’d prefer a lighter graham cracker cake recipe, you can use the one from this Key Lime Pie cake :). Hi Tami! This should totally work with soy or almond milk :). Let me know how it turns out! “It was still eaten, of course”…thanks for the laugh! A cook after my own heart….I have failures, but very few that couldn’t be eaten by someone in the family! The cake is gorgeous, I’m going to try it the next time my sons are home for a visit! Hi Melinda! So glad I could give you a laugh 🙂 Pretty sure all of my failures have been edible for the most part, hah! I hope you try this one! it started to flow down the cake and form a puddle around the plate and would stick to the plate. Yeah, that’s what I had happen with the store-bought stuff but not the homemade 😕. I made the cake and it was going so well. I made my own fluff and after just a few minutes it started to melt i was wondering if this happened to you and if u had any tips in the future. Hi Gaby! At what point did the fluff start to melt?? It should stay nice and firm (quite firm actually). Did it actually whip up to be stiff and then it got soft? Hi I am for sure it wiped up right and it would melt only 5 minutes after doing it. It tasted very good though! Hmm, thats so bizarre, I can’t say why that would have happened! 🙁 Glad it still tasted great ;). Hmm, I don’t think so. What do you mean by melted, exactly? Where does Gaby live? Maybe the humidity or altitude affected her fluff. I made it! This what my eight year old picked out for his birthday. It turned out great–thank you! This is a beautiful cake! I can’t wait to try it myself. Hi Chris, I’m sorry the cake didn’t work out for you. If you’d read my post you’d know that I had issues with the store-bought and ended up making my own. I couldn’t be sure that the store-bought caused the issue though, so didn’t want to discount it. I decorated the s’mores cake with the homemade marshmallow fluff that I linked in the recipe. 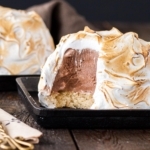 The baked Alaska was made with simple meringue — they are not the same thing. Thanks for your feedback. I’ll remove the store-bought from the recipe. I made this cake and the homemade fluff, and it turned out beautifully!! Maybe try again, Chris? The result was so worth it. YUM! What is the value of lining the pan with parchment paper? If I’m grease and flowering, how do I properly apply the paper? Is the paper supposed to be smooth or creased? Dose that effect the surface of the cake? Hi Sarah!! Lining the pan with parchment helps ensure the cake releases properly and doesn’t stick to the bottom. It’s another safety measure to get the cakes out perfectly :). I use either Pam for Baking or Homemade Cake release to grease/flour the pans, and the parchment sticks quite well to those. If you’re having trouble getting the parchment to stick, I might recommend greasing the pan sticking on the parchment, greasing the parchment and then flouring the whole thing. The parchment should be as smooth as possible, though some small crinkle here and there won’t make a difference to a layered cake :). I made this for my fiancé’s birthday today and it was a hit! I used two 8 inch cake pans and baked for 30 minutes and it was perfect! Yay! I’m so glad you liked it Colette :). Glad to hear this worked well for you! I’m planning to double the recipe and do four 9-inch layers (because I only have 9-inch pans). Did you happen to make it the day before? I’m hoping to make it tomorrow (Thursday) for a Friday birthday. Thanks in advance for any tips! Hi Jessica! You can totally do it the day before. All elements can be made in advance and you can assemble it day before or day of. I would maybe keep it in the fridge overnight and take it out 2-3 hours before you plan to serve it :). Let me know how it goes! Hi Anna, it tastes delicious! You can read more details about the flavour in the post itself. Hi Mary! It *should* hold up overnight, but might look better same day. You could always frost it, stick it in the fridge, then torch it the next day? Can this be modified to make cupcakes? If so, any suggestions on what to change? Hi Kelly! Yes, you can make this into cupcakes but you would need to reduce the baking time. Start with 20mins and see how they are. I would then recommend spreading the ganache on top of the cupcakes and topping with marshmallow. Let me know how they turn out! Hi, it says it will make a six inch 3 layer cake…but there are four layers in your picture? Hi! One of my layers didn’t work out when I was decorating it, so I took the remaining two and cut them in half horizontally. You can find specific details in the post above. I just made this with store bought marshmallows fluff. It wasn’t you, it was the fluff. Had to scrape it off my cake and improvise with roasted marshmallows to cover it up. Hope it tastes as good as it looks! The cake recipe worked so well though, I never have good luck with white cakes but this has been the exception. Hi Heather! Glad to know it wasn’t just me. I’ll definitely be making my own fluff from now on. I hope you loved it! I just had the same problem. Used store bought fluff and it settled and started sliding off the cake, had to scrape it off and make the homemade. Hi Amy! So glad it wasn’t just me. I’m sticking with the homemade stuff for sure! I’m scared to make the fluff. I have to though. This is the cake our granddaughter wants for her 15th birthday. Hi Tricia! I understand your fear with the fluff — boiling sugar is not fun to work with! It is worth it though. Maybe do a test run first? If that doesn’t work out I can give you an alternative :). Olivia, my niece showed me your site and I love it! You are quite talented in many creative endeavors. I am interested in your S’mores Cake. How many would your recipe feed? Have you ever made it in larger cake pans? My niece would like me to make this cake for her son’s 2nd birthday party so I am wondering if I should make a few of the 6″ or make increase the recipe. What do you think? Thanks for any help you can give me. Hi Maureen, thank you!! Do you have three 8″ round cake pans? If so, you can double the recipe and it would work just fine :). A 6″ three-layer cake would feed 8-12 people depending on how generous the pieces are :). Ok, I was getting teary-eyed just PICTURING that scene with the meerkats, omg :'(. I’m a sucker for animals too, so always have to have tissues nearby when watching stuff like that! I’m so glad to hear that people like to see the fails! I wasn’t sure if I was going to include them at all, because they are SO bad, but I figured, why the heck not. I’m far from perfect and fail (a lot) in the kitchen, so people should know that it’s not always a pretty picture. Most often, it’s not :). I’m also planning to make this for a larger crowd. If I double the recipe and use three 8″-pans, how long would you recommend baking it? Hi Amanda! You *shouldn’t* need to adjust the baking time too much as you’re increasing the volume and the pan size. I would start checking them at 30mins and see how they’re doing. This looks amazing! I really want to thank you for posting the “fails”. I completely understand the cursing, pissed off moments in the kitchen. I often thought to myself “why do none of people I get these recipes from have trouble like this?” in a weird way, your post comforted me. I think somehow my husband secretly hopes I have the fails so he can take advantage of the scraps. Can’t wait to try this cake! Thank you so much for this, Lori! Glad to know people appreciate the fails ;). I have SO many fails, it’s hard to not include them. This one really took the “cake” though. And yes, my husband has benefited from many of the fails as well!! Love the idea of the graham flavored cake! Your fridge pics brought a smile to my face because I have totally been there. Great post! Haha, thanks Jacquee! The graham cracker cake is mega-delicious! I plan to combine it with other flavours in the coming months :). It is absolutely stunning Liv! I love the jagged layer of marshmallow fluff! Pinned! P.S. – I need to buy a blow torch asap, that marbling/burnt effect is beautiful. Ahh thank you for that! What a great quote, it’s so appropriate! And yes, you need a torch! It’s the best thing ever :). You were VERY gutsy to take pix of the, uh, ones who didn’t, uh, make the grade. Got a couple of giggles from them, thanks! The acacia serving piece is gorgeous too. Pray for Paris. Haha thanks Lizzie! I often have fails, but am too annoyed to take pictures of them. Glad you got a kick out of it! Beautiful pictures! 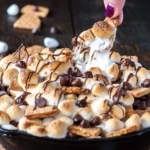 i am a huge s’mores lover and this looks heavenly! Oh my gosh what an amazing cake and I LOVE that cake stand?! Did you make it yourself? They actually have ones that are proper cake stands (https://www.chapters.indigo.ca/en-ca/house-and-home/gifts/acacia-wood-pedestal-medium/882709172031-item.html?ikwid=wood&ikwsec=Home&ikwidx=4), but they weren’t round enough so I went with the serving plate :). Oh my goodness, Olivia, you made marshmallow fluff?? You are my total hero!! This cake is beyond divine! Thank you Kim!! It’s actually really easy to do, I just don’t love working with molten hot sugar :). You would LOVE it June. It’s definitely a favourite over here :).